Definition at line 156 of file llevent.cpp. Definition at line 159 of file llevent.cpp. Definition at line 171 of file llevent.cpp. Definition at line 179 of file llevent.cpp. References LLListenerEntry::filter, LLEventListener::handleAttach(), LLListenerEntry::listener, mListeners, mParent, NULL, removeListener(), and LLListenerEntry::userdata. Definition at line 219 of file llevent.cpp. Definition at line 206 of file llevent.cpp. Definition at line 191 of file llevent.cpp. Referenced by addListener(), and ~LLSimpleDispatcher(). Definition at line 167 of file llevent.cpp. 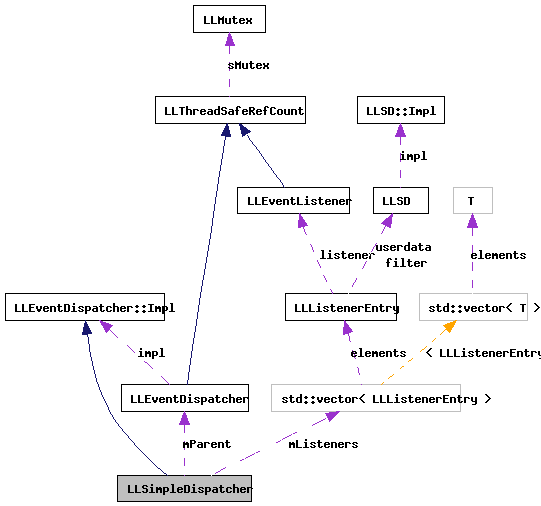 Referenced by addListener(), fireEvent(), getListeners(), removeListener(), and ~LLSimpleDispatcher(). Definition at line 168 of file llevent.cpp.